The Block Fort: Just launched our Domain and Twitter account! Also, what to expect from us. Just launched our Domain and Twitter account! Also, what to expect from us. But more importantly, the personality and charm that makes The Block Fort what it is. 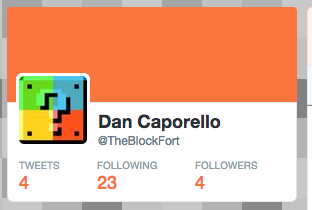 So let's see that "Followers" number rise! You can now find us at theblockfort.com! Can you feel the excitement!? I realize that it's overly optimistic of me to assume people are just going to jump onto a bandwagon that they don't fully understand. But I'm excited. And I'm pretty confident that we have something unique here at The Block Fort. One thing I want to keep pursuing is community. Although I'm the admin for this site, I want our readers opinions and thoughts to be heard loud and clear. Even the unpopular opinions. If I write something, and you think it's 100% wrong, say so! I'm not afraid of the criticism and I even welcome an open conversation, as long as everyone's respectful and you're ready for my witty rebuttal. Being a Nintendo fan, I'm always finding a balance between past and present. Part of the pull for me has to do with the fond memories I have playing through all generations of Nintendo consoles. The ups, the downs, the in-betweens, all of it matters. and contrasting past experiences with modern games can be an eye opening experience. I'm all for writing about retro games as much as I am current ones. And analyzing Nintendo's arc as a whole can be fascinating too. There's lots to talk about. And lots of you to do. I hope you'll jump in for the ride and see where it takes us! Welcome!